The glass boat is designed strategically to give it a look of an aquarium from the bottom. Glass boating is a boat with one or more sections of glass, or other suitable transparent material, below the waterline allowing passengers to observe the underwater environment from within the boat. The visitors can sit on the couches placed on top of the robust glass base of the boat. 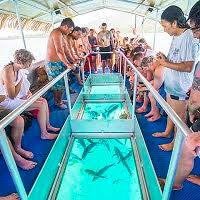 If you want to experience, the marine life without even getting wet, then booking a glass boating is the best option for you. So, discover the beauty of the deep ocean by booking a glass boat trip for you and your family.